For other uses, see Noapara. A train approaching Noapara metro station. Noapara Metro Station is the newest and largest station of the Kolkata Metro situated in Noapara, Baranagar. It opened on 10 July 2013 with limited facilities. These include four platforms with lengths of 182 meters, unlike other Kolkata Metro stations. 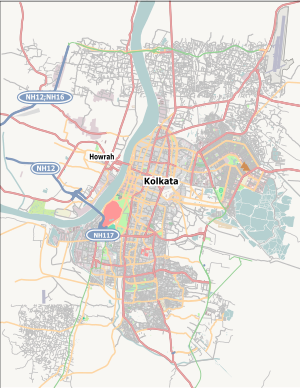 and it will cater the communities of Baranagar, Sinthee, Tobin Road, Dum Dum Cantonment and Durganagar. The station has 2 stories, with 6 escalators and 4 elevators. There are also 31 CCTV cameras for increased security. The Kolkata Metro owns a 147-acre car shed for maintenance and storage of rakes immediate east of the station. Noapara elevated metro station situated on the Kolkata Metro Line 1 of Kolkata Metro. Interior of Noapara metro station. ^ Gupta, Jayanta (21 November 2012). "March 2013 date for Noapara Metro". Times of India. Retrieved 30 May 2013. ^ Gupta, Jayanta (25 May 2013). "Noapara metro opening expected by month's end". Times of India. Retrieved 30 May 2013. ^ Banerjee, Tamaghna (11 March 2013). "Noapara Metro from April". The Telegraph. Retrieved 30 May 2013. ^ Chakroborty, Ajanta (25 December 2012). "From April, fly to Naoapara from Garia in 54 mins flat". Times of India. Retrieved 30 May 2013. Wikimedia Commons has media related to Noapara metro station. Google. "Noapara metro station" (Map). Google Maps. Google. This page was last edited on 14 February 2019, at 23:47 (UTC).